Top results at the RM Sotheby’s Monterey Pinnacle Portfolio car auction were $17,600,000 for a 1964 Ferrari 250 LM and $13,750,000 for a 1998 McLaren F1. This set a new marque record for a McLaren sold at public auction. Of the 25 cars on offer, 15 sold for more than a million dollar while two further multi-million bids were rejected, including $13.25 million for a 1960Ferrari 250 GT SWB Berlinetta Competizione by Scaglietti. Only around 20 cars have ever been sold at public auction for prices over $10 million. Prices include 10% buyer’s premium. 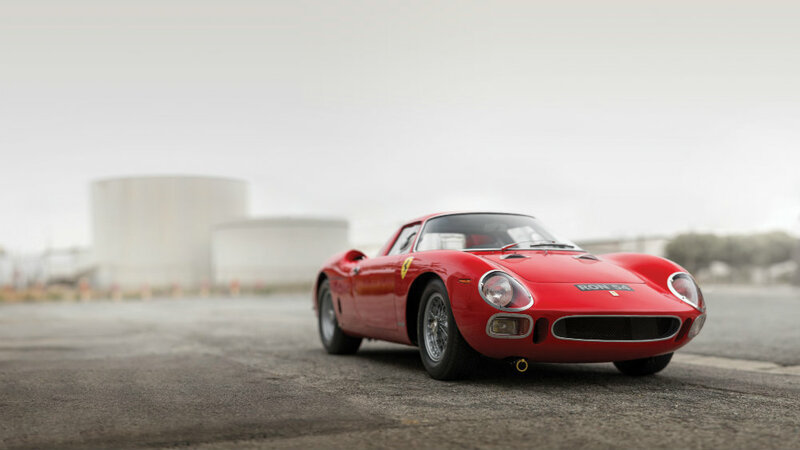 The 1964 Ferrari 250 LM by Scaglietti achieved $17,600,000 at the RM Sotheby’s Monterey 2015 sale. This is the second highest price paid for a car at public auction thus far in 2015 and a new model record. The Ferrari on offer was the 23rd of only 32 produced and considered one of the best examples in existence. It was successfully raced in period by Ron Fry, David Skailes and Jack Maurice. A new marque record of $13,750,000 was set by the 1998 McLaren F1 “LM Specification” at the 2015 RM Sotheby’s Monterey sale. The car was the second last of the 63 road-specification cars built and one of only two upgraded to “LM Specification”. The opening bid for the 1998 McLaren F1 “LM Specification” already shattered the previous marque record of $8,470,000 set at the Gooding 2013 Pebble Beach auction. An $8 million highest bid for a 1959 Ferrari 250 GT LWB California Spider was initially rejected (pre-auction estimate $9-11 million) but the car was subsequently sold for $8.5 million and added to the official auction results. A 2005 Ferrari Enzo achieved a magnificent $6,050,000 – this car was the final of the 400 produced and had Pope John Paul II as first owner. The car is “as new” with only 179 km on the clock. A 1994 Ferrari F40 LM sold for $3,300,000 – well over the pre-auction estimate of $2-2.5 million. It was the last of the 18 factory F40 LMs produced. It was never raced and thus in probably the finest original condition of all these cars but lacking a racing history. A 1967 Ferrari 275 GTB/4 sold for $3,300,000 – the car is in a magnificent condition with a dark blue body over blue interior. The 1972 Ferrari 265 GTB/4 Daytona Spider sold for a slightly disappointing $2,750,000 – well below the $3-3.5 million estimate. Only 121 Daytona Spiders were ever produced. The 1985 Ferrari 288 GTO achieved $2,420,000 – a good result for the rarest of the Ferrari supercars. This model was the 129th of only 272 produced. The 1995 Ferrari F50 sold for a strong $1,980,000. Only 349 F50s were produced with only 55 in US specification. A 1971 Lamborghini Miura P400 SV by Bertone achieved $2,475,000. Miuras are increasingly selling for over a million dollars and this car in impressive condition is one of only 148 SV specification versions. A more modern 2008 Lamborghini Reventon sold for $1,375,000. It was the seventh of only 20 made and with only 900 miles on the clock is basically unused. A 2005 Maserati MC12 sold for a strong $2,090,000 – the pre-auction estimate for this road-legal FIA GT racing car pedigree car was a more modest $1.5-1.9 million. Only 50 were built. The Pinnacle Portfolio at the RM Sotheby’s Monterey 2015 sale had the first and the final Bugatti Veyron coupes produced on offer. The 2006 Bugatti Veyron 16.4 “001” sold for $1,815,000 while the 2012 Bugatti Veyron 16.4 Super Sport “300” achieved $2,310,000. Both results were at the lower end of the estimates. A 1988 Porsche 959 Komfort sold for $1,210,000. A further three 959s will be on offer at auctions at the 2015 Monterey classic car week. A 1967 Toyota 2000 GT sold for $850,000 – below its target of a million dollar. A further three similar cars will be on sale during the week. The headline car for the sale – a 1960 Ferrari 250 GT SWB Berlinetta Competizione – had a highest offer of $13,250,000 rejected. This was the second highest bid of the day. A similar car failed to sell at the RM Sotheby’s Villa Erba sale earlier in the year. $4,500,000 is usually sufficient to buy three to four Mercedes Benz 300 SLs but this highest bid was rejected for the 1955 Mercedes Benz 300 SL Alloy Gullwing on offer. The estimate was $5.5-$6.5 million. Only 29 Gullwings were produced with alloy bodies.